Families displaced by tourism development seek fair compensation (file photo from November 2010). - Cam McGrath/IPS. Mohamed Saeed’s battle with a wrecking crew ended predictably. His refusal to leave the home his grandfather built and defiant attempts to throw himself in front of the giant hydraulic hammer bought his family some time, but by the end of the day their two-storey house was reduced to rubble. 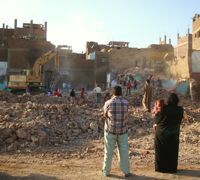 Saeed, a souvenir shop employee, was one of thousands of Luxor residents forced from their homes to make way for a controversial tourism development plan. The project aims to transform Luxor, a southern Egyptian city of 400,000 built over the world’s richest collection of antiquities, into a vast open-air museum. The master plan envisions new roads, five-star hotels, glitzy shops, and an IMAX theatre. The crux of the plan is an 11 million dollar project to unearth and restore the 2.7-kilometre-long 'Avenue of Sphinxes' that once linked Luxor and Karnak temples. The ancient processional road was built by the pharaoh Amenhotep III nearly 3,500 years ago and took its final form under Nectanebo I in the 4th century BC. More than 1,300 stone sphinx statues lined the paved road, which fell into disuse in the late Roman era and were lost beneath a thick layer of silt. Over the centuries the ancient route was covered by houses, mosques, churches and fields. Excavation of the buried avenue began six years ago. Quarterbacking the operation was Samir Farrag, a man once more loathed and feared in these parts than Mubarak himself. The former army general, Luxor’s governor from 2004 until his sacking in April, prided himself on his military efficiency. Farrag told IPS in February 2010 that the government had earmarked a 'generous' 5.5 million dollars as compensation for the 800 families whose homes were demolished in the process of excavating the ancient processional route. Displaced residents dispute these figures. Some claim that over 6,000 buildings were destroyed before the project came to an abrupt halt after the Mubarak regime's fall in February. Others contest the details of the compensation arrangement. Ahmed Elsayed, a souvenir salesman, says the compensation flats offered were neither close to the original homes, nor of comparable size. Many of them were located in remote districts such as New Tiba, a poorly developed area 15 kilometres northeast of Luxor. Officials have highlighted the archaeological treasures unearthed during the excavations of the buried avenue, including ancient chapels, a Roman wine factory and nearly 900 sphinx statues — some in remarkably good condition. They say the restored antiquities will draw tourists and provide much- needed jobs and revenue for the local community. But archaeologists critical of the project charge that Egyptian excavators hastily levelled dozens of historic buildings, damaged antiquities and neglected proper scientific study. UNESCO, which initially approved and funnelled money into the project, slammed the use of bulldozers to dig a trench to expose the sphinxes. Some of the agency's consultants also voiced dissatisfaction with the hurried pace of the excavations, which they feared was turning historic Luxor into a sanitised Disneyland exhibit. The sphinx avenue restoration has also come under fire from local activists, who say the project reeks of crony capitalism. They accuse the government of displacing thousands of families in order to flog off valuable real estate to high-end developers, including the former governor's closest business associates. 'Opaque land deals were made without any public tenders,' charges Abdel Aziz Moustafa, a court translator. Farrag, who is currently awaiting trial on corruption charges related to a separate land deal, could not be reached for comment. However, he told IPS last year that rumours of murky transactions were 'unsurprising' but patently false. Tourism experts estimate the restored sphinx avenue will generate at least 50 million dollars a year. Residents argue that a portion of this amount should go to the families who were uprooted from their homes to make room for the new attraction and its commercial concessions, including hotels, restaurants and shops. Said Galal, a plumber at a popular tourist restaurant, says he initially opposed the project, but since 'irreparable damage' has already been done, and the project is 90 percent complete, the government should complete the work quickly and open the site to revenue-generating tourism.